Bianca: For many years Alex and I had been discussing a US trip – Late December 2013 all our planning and saving had paid off. We had a whole 7 weeks ahead of us with two travelling companions. Numerous states, too many plane rides to count and an absurd amount of food. Over the next few weeks, we’ll be uploading our holiday recaps by state. We hope you come back and enjoy reading about, what was certainly a holiday of a lifetime. Generally when one thinks of Hawaii it’s usually shorts, thongs, Hawaiian shirt and an iced drink poolside. I wish we could say this was an adequate description of our time on the island of Oahu but ours was less geared towards the beach, and more at shopping and eating. 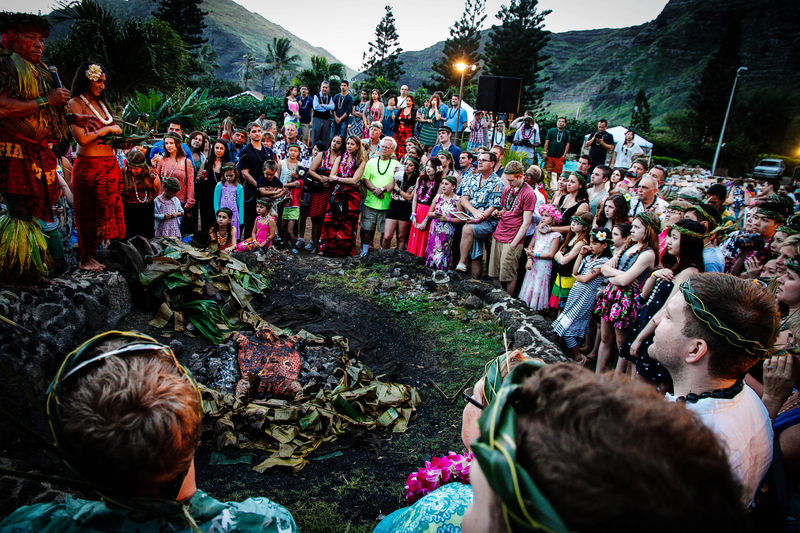 Something we were all excited for was the typical Hawaiian to-do, a Luau. Chiefs Luau at the Sea Life Park, with beautiful ocean and mountain vistas was truly an experience of a lifetime. The night began with a Mai Tai and weaving of our very own banana leaf headband. Included in the ticket price was a traditional buffet, our first introduction to delicious taro rolls, succulent Kalua pork and poi. The rather non-descript, average tasting poi (similar consistency to paste) is made from the stem of a taro plant. We finished the night with a slice of pineapple cake and hours of Polynesian dancing. KCC Farmers market, held on the community college grounds at the base of Diamond Head is an enclave of farm fresh fruit and vegetables, fresh flowers, juices and stall after stall of mouth-watering delicacies. One of our food highlights from our USA trip was found at these very markets. A chicken taco encased in a crunchy fried taco shell, with lashings of creamy yoghurt sauce, tomatoes and lettuce. Many conversations were later had about that very taco, weeks down the track. 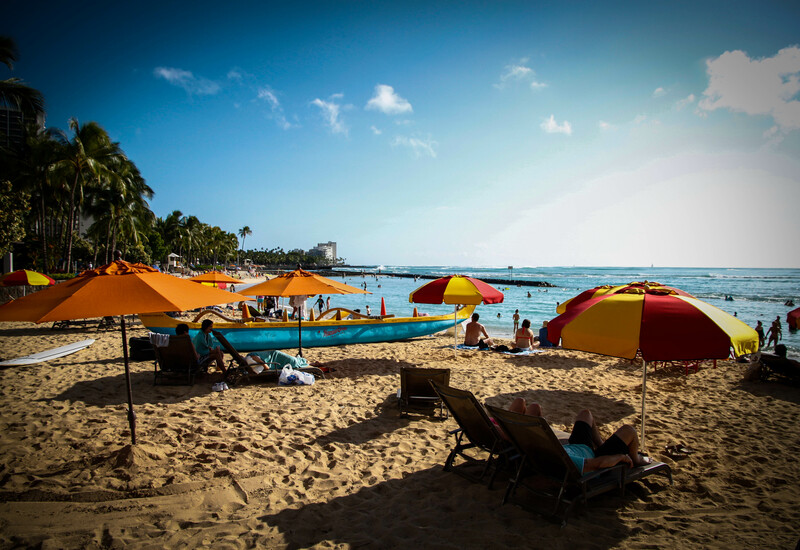 Dukes on Waikiki beach is one of those staple Waikiki landmarks or ‘food-marks’ as we like to call them. As we settled in to the beautiful tiki like bar, overlooking Waikiki beach we had our first taste of American hospitality. We shared the White-Bean and sundried tomato hummus. A puree of cannellini beans and sun dried tomatoes served with feta and flatbread. A hike up Diamond Head earlier that day left us tired and incredibly hungry, so to recall what this tasted like is quite the challenge. It was virtually hoovered as soon as it hit the table. 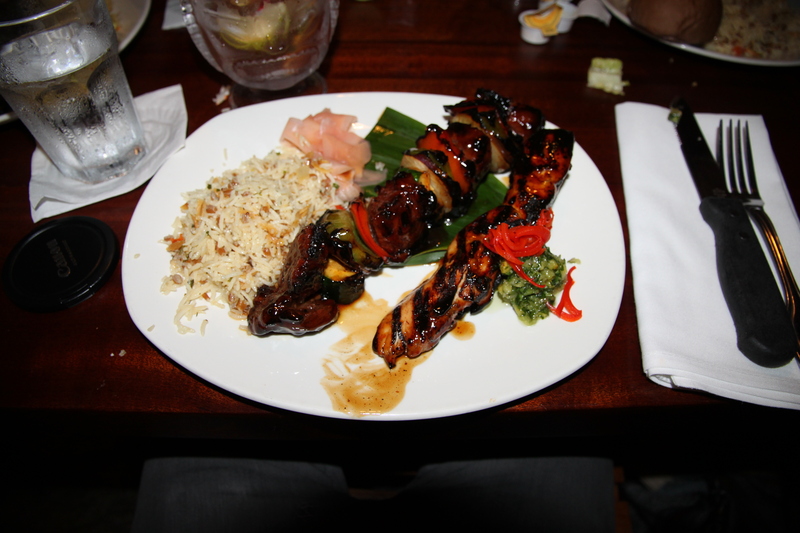 Next was the Huli Huli chicken and the Kushiyaki Kabob – skewers with chicken and steak both served with rice and roast vegetables. Before our main we were told by our server to ‘hit’ the salad bar. Boy oh boy, that was quite easily one of the best surprises of the evening, a cornucopia of make your own salads, pastas, mixed grain salads, taro rolls and sweet buns. We shamefully snuck a few home with us that night, ater being told by the server that was ‘frowned’ upon. Dignity was definitely left at the door that night. Breakfast was at the Verandah at the Beachouse, at the beautiful Moana Surfrider hotel on Waikiki Beach. We went on two separate occasions, once at the start of the trip and on our a very last day of our holiday coming back to Sydney. Our first visit to the Verandah at the Beach house we had intentions of continuing to eat healthily on our trip. That was pretty much blown out of the water 2 days later in New York. We shared the egg white omelette with spinach, cheddar and a cherry tomato salad. Our second visit I had the Superfood breakfast wrap – with scrambled eggs, smoked apple wood bacon, cheese, onions, peppers, mushrooms served in a spinach tortilla wrap with skillet browned potatoes. A far cry from that egg white omelette 7 weeks earlier. Alex had the Tahitian vanilla French toast with maple syrup and whipped honey butter. Mainly to rectify buyers regret after our first visit. We were pretty much told by everybody that we had to visit the Cheesecake factory at least once in the USA. Hawaii was our designated Cheesecake factory deity. We were aware of the ridiculous wait times, so we opted for an early dinner. Alex had the Americana Cheeseburger- with American and cheddar cheese, crunchy potato crisps, lettuce, tomato, grilled onions, pickles and special sauce served with Sweet potato fres. I had the Kobe burger – with Kobe beef, sautéed onions and mushrooms on a brioche bun. Most of us left pretty sleazy that night, the cheese, the sauce. ..It was tough. The consensus at the beginning of the night was for cheesecake but there was no room in the belly for glorious cake. Which is why we made it our mission for our last night in Honolulu at the end of the trip. Nothing was standing in our way of cheesecake destiny that day, Alex and I shared the ‘Adam’s Peanut butter cup fudge ripple cake’. Decadent, rich, creamy all things one could possibly want in a slice of heaven. Eating that cake, on a bench on the Waikiki beach strip with passers-by, glancing at our chocolate covered face’s may not have been our finest moment but one we both look back on fondly. Hawaii, specifically Honolulu is one of those magical places. The locals were friendly and always willing to have a chat, warm Australia like weather and delicious food. We can’t wait to go back . I’m really enjoying reading about your travels & eating out in Hawaii, can’t wait to go try some of the sensational food myself.